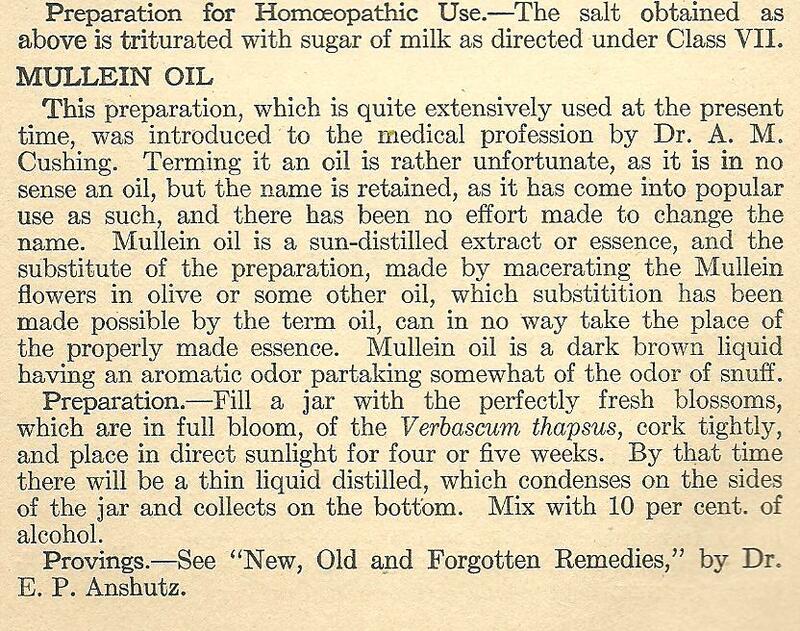 The following is the page-copy of the AMERICAN HOMOEOPATHIC PHARMACOPEA published by Boerick and Taffel Homoepathic Pharmacy, U.S.A. for the preparation of MULLEIN OIL. 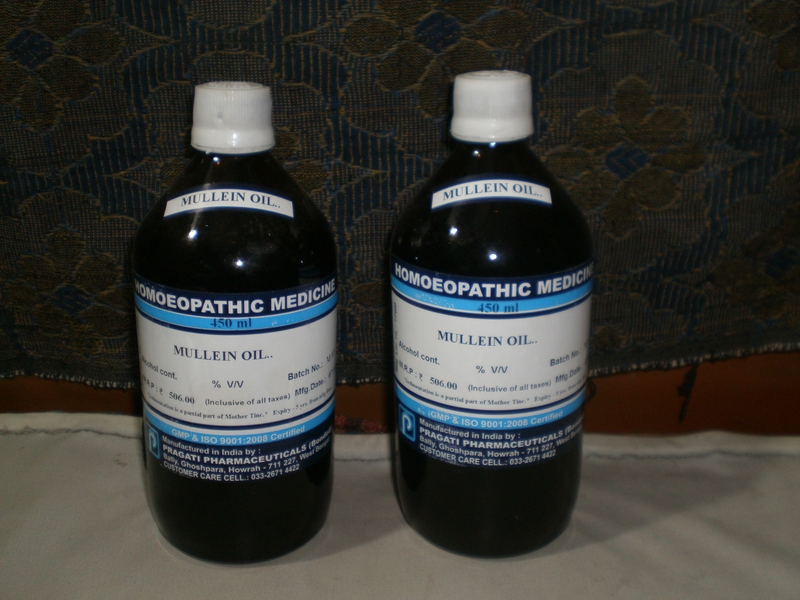 MULLEIN OIL ESSENTIA is very powerful than comparatively MULLEIN OIL prepared with Olive Oil. Unfortunately Mullein Oil essentia is not available and almost no phramacy prepare it due to heavy cost in production. Prepared Olive Oil Mullein in condence for should be used and this preparation is also very effective in all nature of the EAR disorders, whatever they may be. My Father Late Doctor Shitala Sahai Bajpai, Vaidya Bhshan , M.D.H. [died 1977] was using this remedy in plenty in almost every Ear disorders and disease conditions like, pain, discharges, swelling, glands, neuragic pain , Ulcers, abscess , suppuration, Infection of all kinds i.e. Infection, Viral . Parasitic and Fungal etc etc cases with great success and wonderful results. I am using this oil in plenty in every Ear Problem patient with great success. In some cases of TEETH NEURALGIA , in which the tooth-ache was shifted to Internal Ear cured by this remedy. The remedy is safe for all ages. One drop is sufficient for Infants and children. More younger may use two to six drops accordingly. More drops are not harmful in any way and is a very safe remedy. 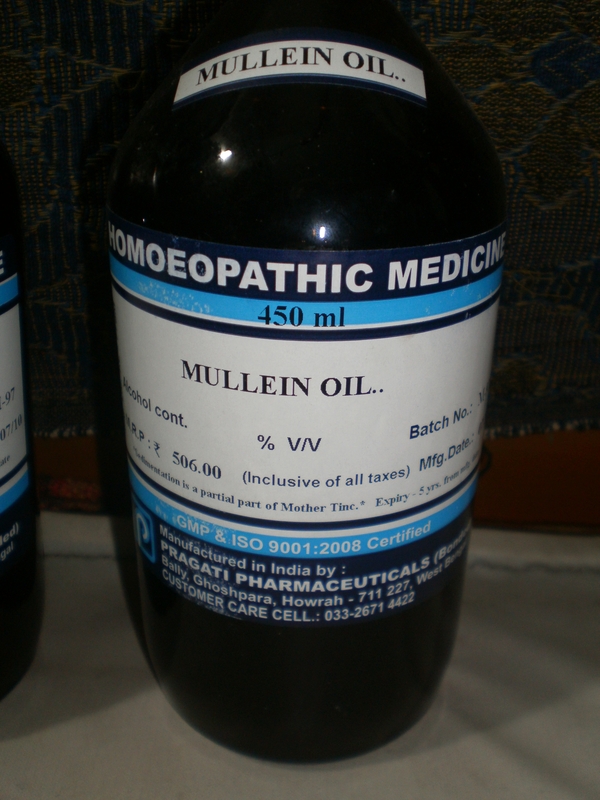 Mullein oil should be used as fresh as it is available and should be kept with tight cap and save from airation. Deaf and dumb patient can not tell their actual physical problems , what ever they have ? We have recieved many deaf and dumb patient often and we found that Deaf and dumb patient what ever they like to tell to patient, no physician can understand their problems totally. 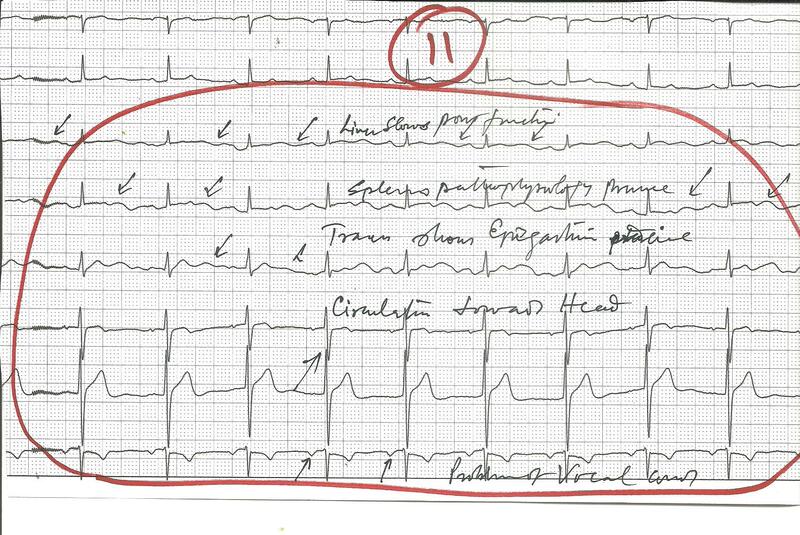 A case of Deaf and dumb patient record is given below and the patient diagnosis. The mother of this patient was very problomatic with the disease condition of her son aged 22 yrs, patient cries always since few years and almost physicians treated him as to their best of efforts, but nobody was able to remove his complaints. The young boy was deteriorating his health and the efforts of the physician could not solve the problem of this deaf and dumb person. His family members were in trouble and was thinking , what to do in this situation ? The problem of this deaf and dumb boy was aggravating every day and non of the examination done was finally able to diagnose the problem. The mother of this young boy was asking every near and dear person about the solution of the boys health asking the better doctor for the solution, one day one of my earlier patient met her and told her about my way of diagnosis and treatment Ayurveda-ayush. She came immediately and ask for the treatment. 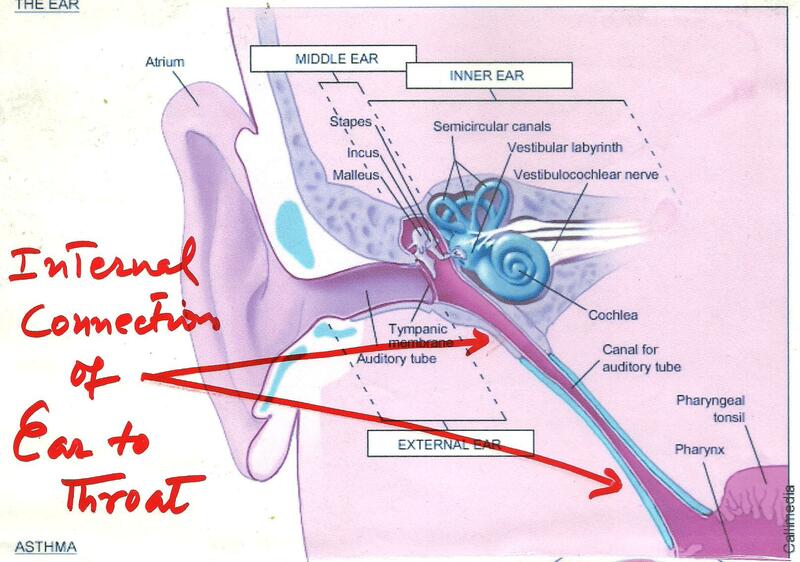 I narrated that my procedure is examination and tests based , which will diagnose the internal problem patient have. 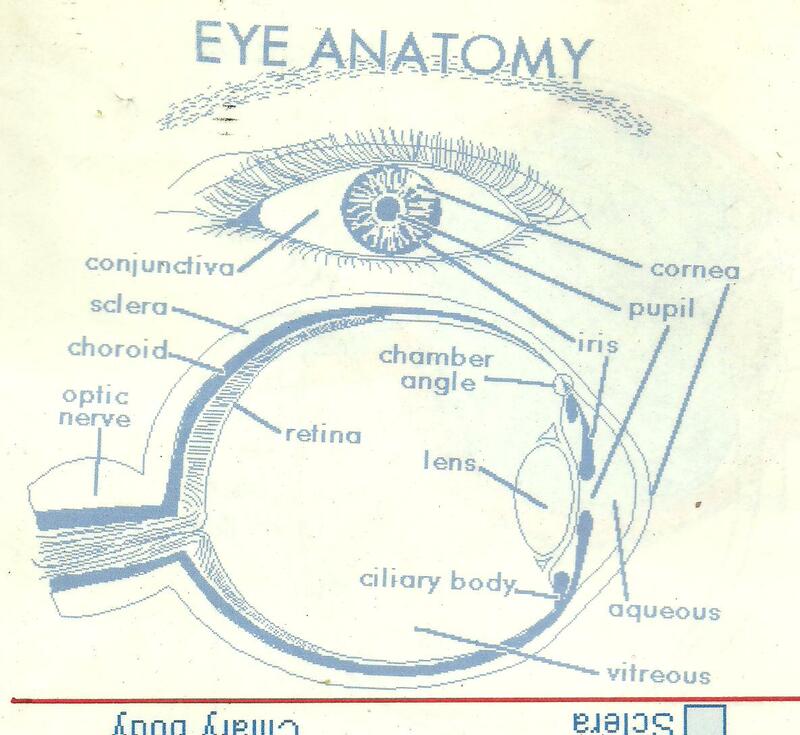 The deaf and dumb patient could not tell any way except the showing the area and facial expressions. The conclusion of this probelm is given below in the parts of the report sections in nut shell. Above report shows the main problems , which are to be treated accordingly by the Ayurveda-ayush remedies. 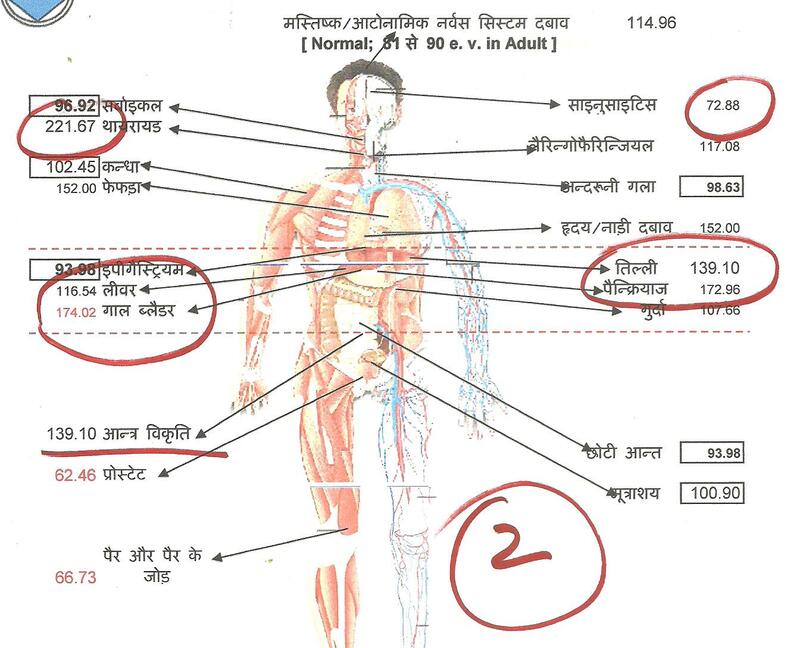 The above data shows the body sectors , which are ailed and to be examined. On physical examination the parts of the body confirms the problem existence. The Brain parts data gave a clue of his old illness history. 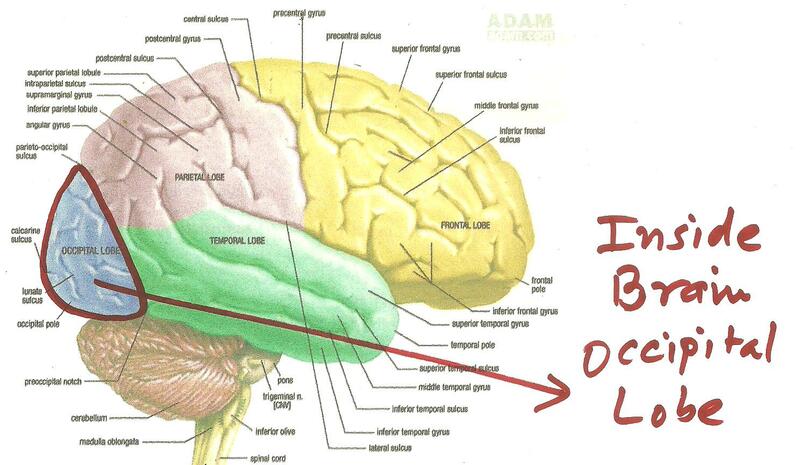 Preital Brain is in higher state and frontal btain is in the lowest level. 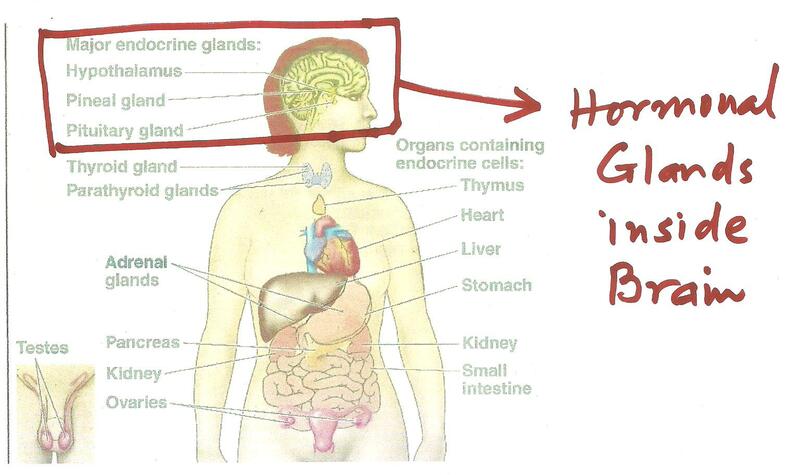 I analysed the data an thought that Parietal Brain controls the THERMAL sensitivity of the body. Patient are very sensitive with thermal changes , if parietal brain data is higher or low. 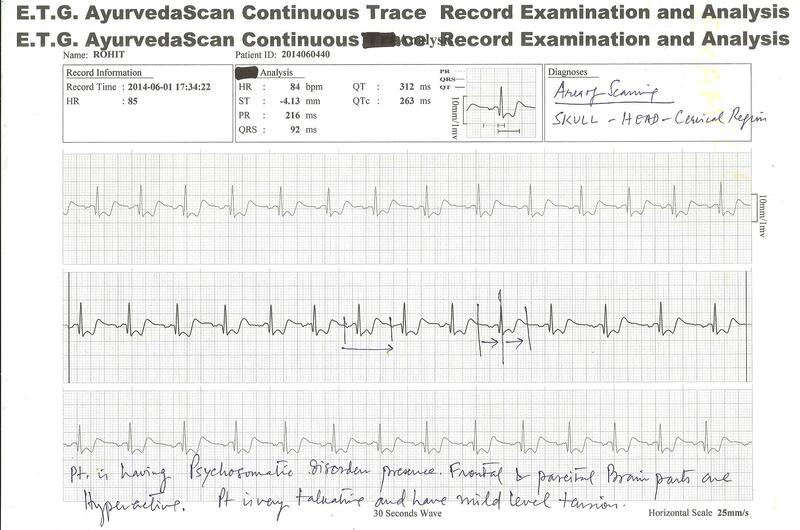 This boy data was very high , I analyzed that it is might possible that the boy in childhooh suffered from high fever and that impacted to frontal brain and the power of listening and speech could be seized, This came after analysis conclusion. To confirm this I asked the mother of Young boy , whether in childhood patient got an attack of High Fever ? She confirmed it and narrated that at the age of 10 months, he got an attack of high fever, which persisted about a month. After many efforts of the doctors , the Fever could not be come down. Lastly one physician controlled the fever. The young boy is sensitive to external natural temparatute. 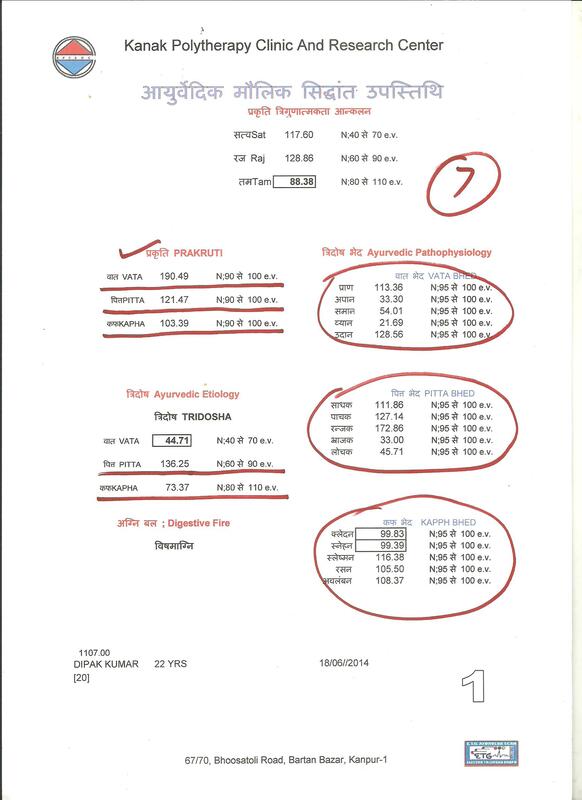 The data of throat shows the presence of anomalies in internal parts. Below given data is a shorting of Higher subject’s data of the essential problems , which are to be considered. 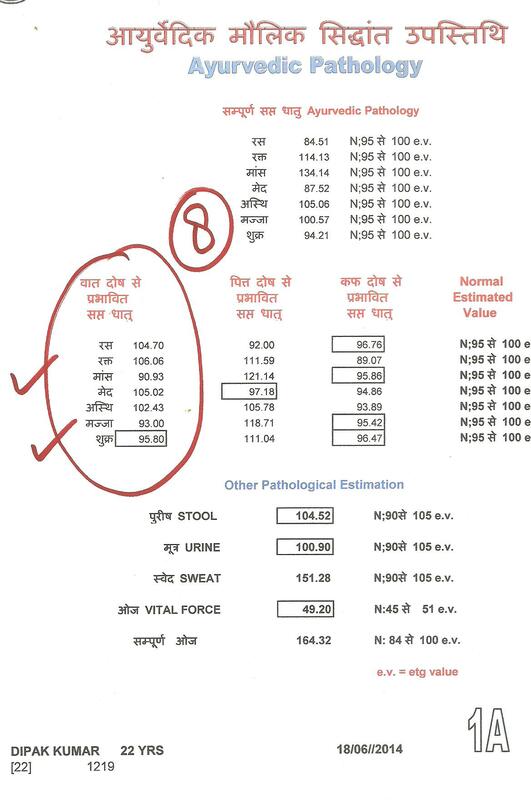 Below is the AYURVEDIC FUNDAMENTALS MEASUREMENT of the patient status. Below is the SAPATA DHATU EVALUATION of the patient. 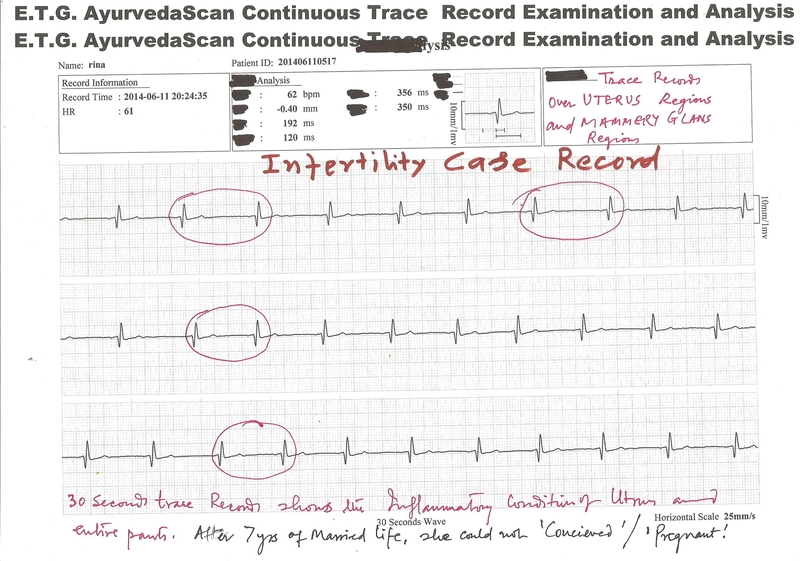 The trace records are the key of the ETG AyurvedaScan examination. 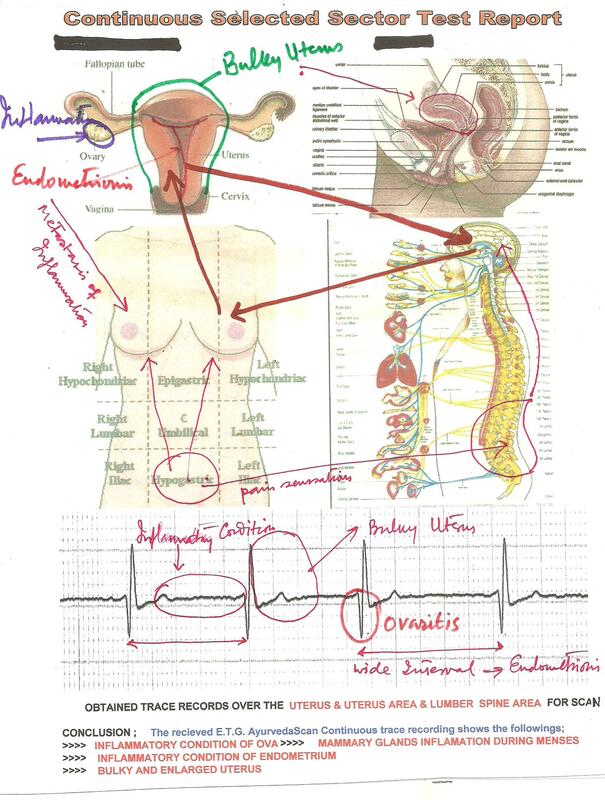 Below traces are taken from the selected areas of the body for diagnosis and internal problem’s persisting anomalies. 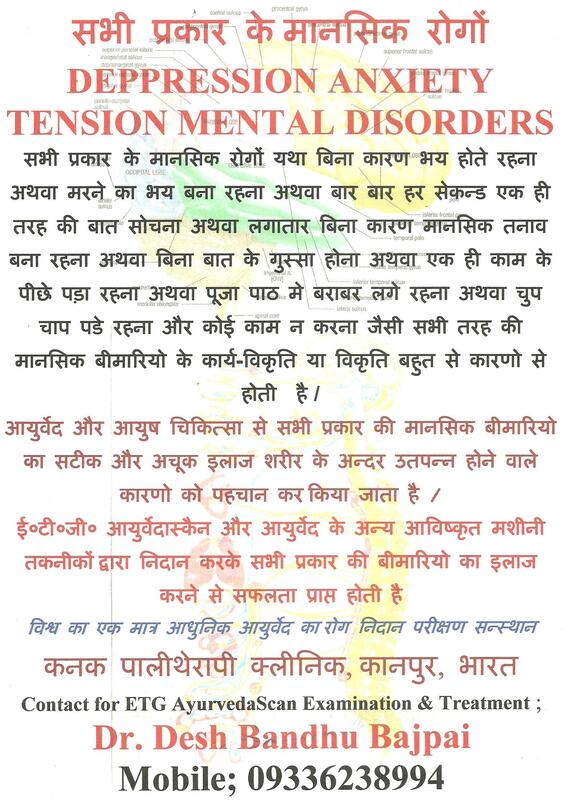 We have always conveyed that ETG AyurvedaScan examination is a tool for examining those anomalies which are or can not narrated by the patient in the state of COMA / UNCONSCIOUSNESS / and for DEAF and DUMB persons / or for those who are not able to tell their problems , what they have. 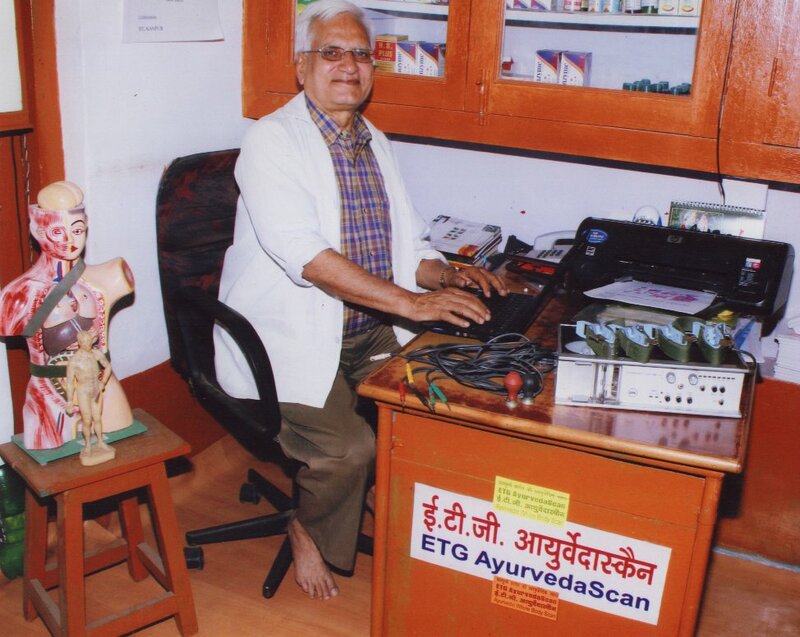 By virtue of ETG AyurvedaScan system, we can somehow know or understand or recognize the trouble of the persons, who are not in a position to convey their problem to the physician. AYURVEDA have now approached to a new heights , saying “SKY have no limits” . 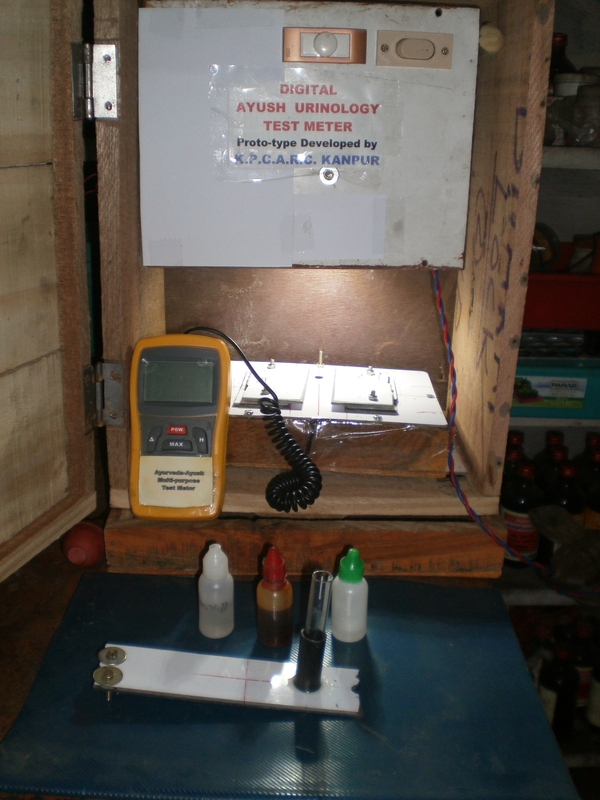 At our research center K.P.C,A.R.C., KANPUR, INDIA have designed and developed and fabricated a new heamometer according to the need of AYURVEDA. The process of examination is based on the fresh BLOOD drops taken from any where from body , but proffered from finger tips of hand and foot , impregnated to chemical paper stripes . 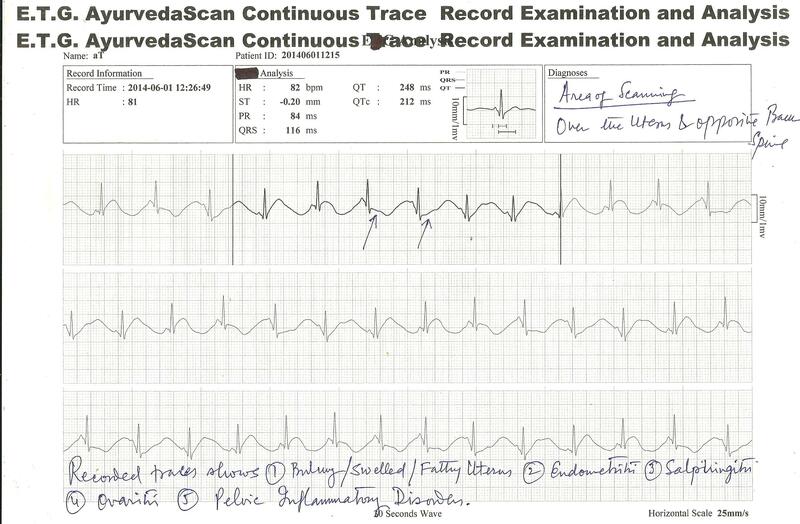 Readings are transferred to computer software, where after analysis report is prepared for diagnosis and treatment and management purposes. The following parameters can be obtained by examining FRESH BLOOD of the sick individual. 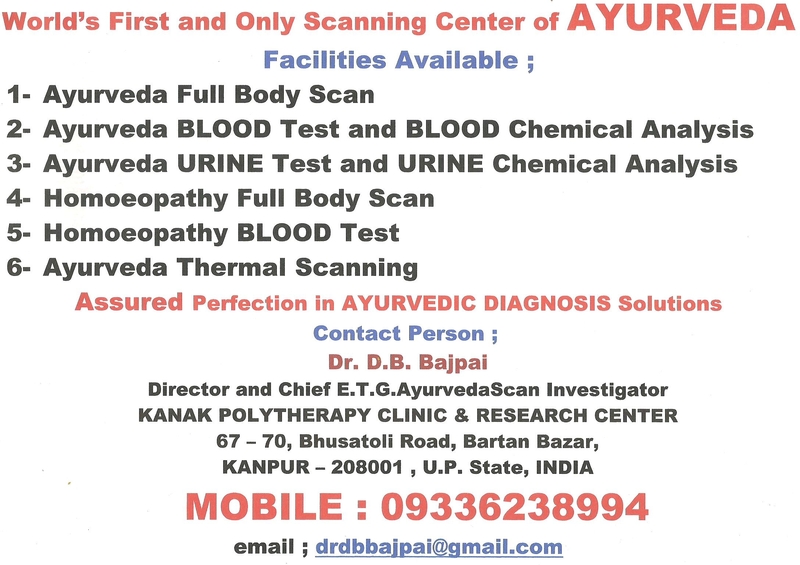 With the help of this meter followingAYURVEDA FUNDAMENTAL PRINCIPALS INCLUDING DIAGNOSIS OF DISORDERS parameters can be obtained examinning blood directly. 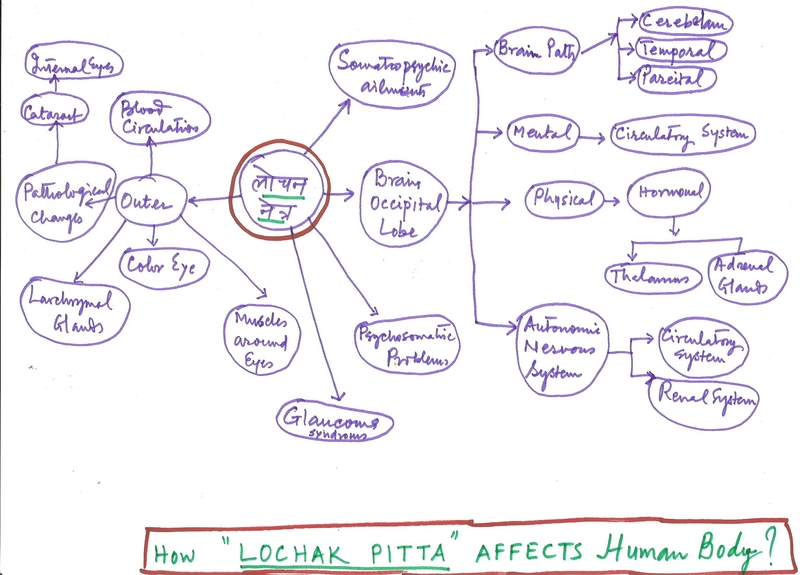 including these parameters FIVE KINDS OF VATA AND FIVE KINDS OF PITTA AND FIVE KINDS OF KAPHA are also quantified. 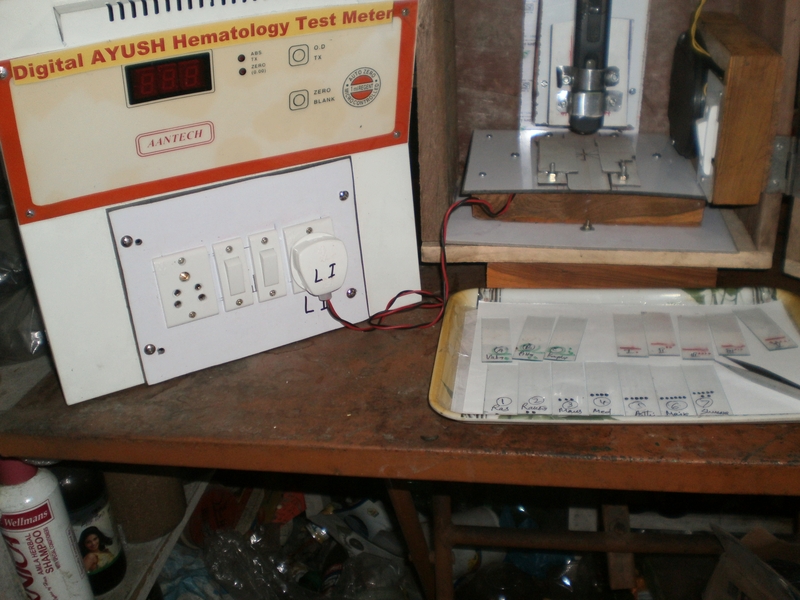 by this meter BLOOD CHEMISTRY IS ALSO TESTED. The following parameters of the BLOOD CHEMICAL CHEMISTRY can be evaluated. Over 70 page Blood test report provides the details of the Disease diagnosis and Fundamentals diagnosis and this helps in treatment and management of the case. Now we are using this machine at our research center and BLOOD EXAMINATION are doing continuously and helping patients. 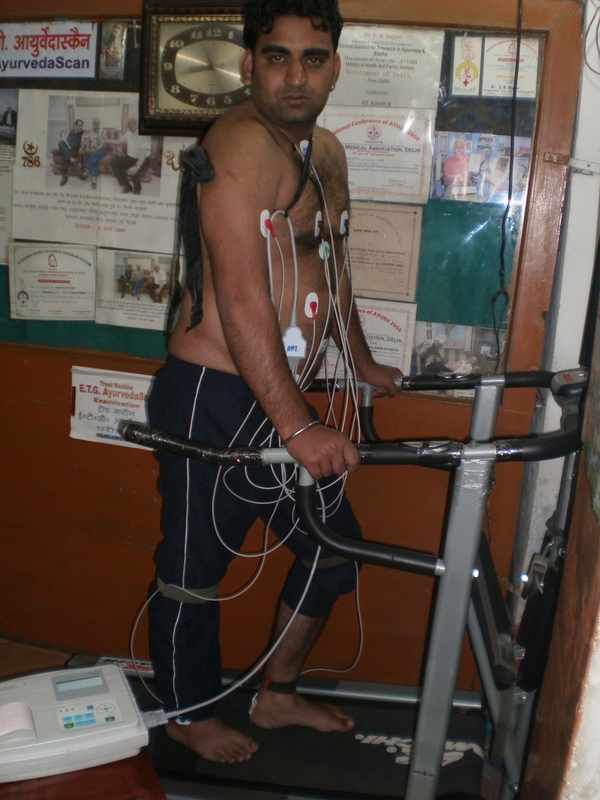 NEW INVENTION of ETG AyurvedaScan system have now introduced “continuous test” of the organs or viscera affected for their minute patho-physiological and pathological studies for diagnosis and other purposes. 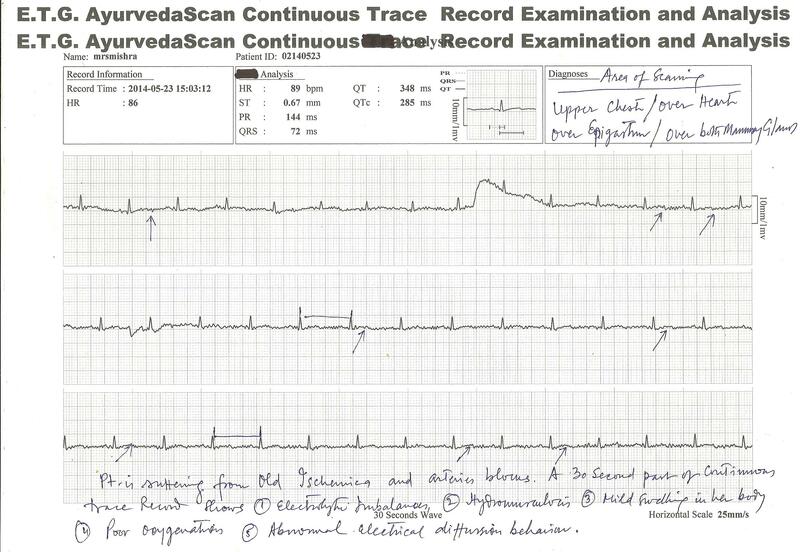 Below is given three patient’s traces , which was recorded at least 04 hours continuously for best diagnosis and pin-point problem solutions. E.T.G. 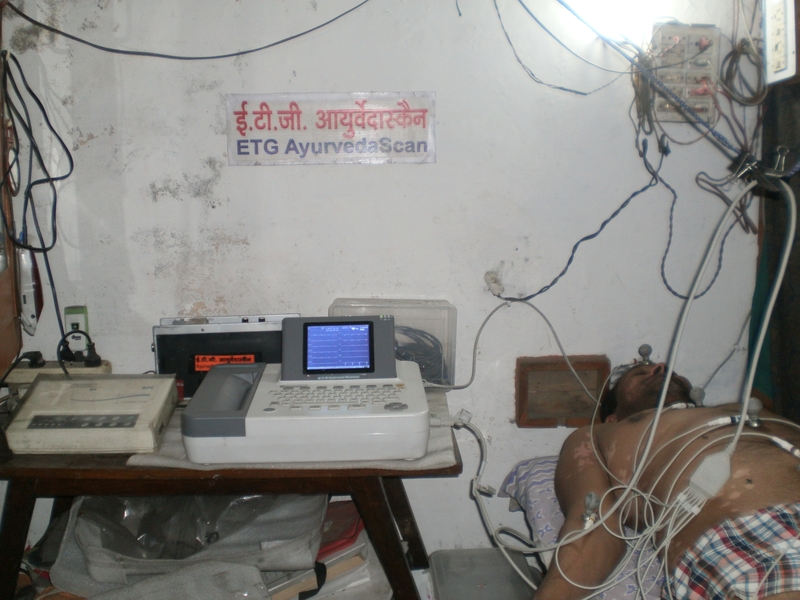 AyurvedaScan CONTINUOUS TRACE RECORDING SYSTEM provides regular monitoring of the affected area or patient problems diagnosis and to know , what is happening with the patient within 24 hours or within 48 hours oe more , may be monitorised by this system. Many patient complaints that they feel problems at any hours of the day or night , for them this process is beneficial to trace the problems they have. 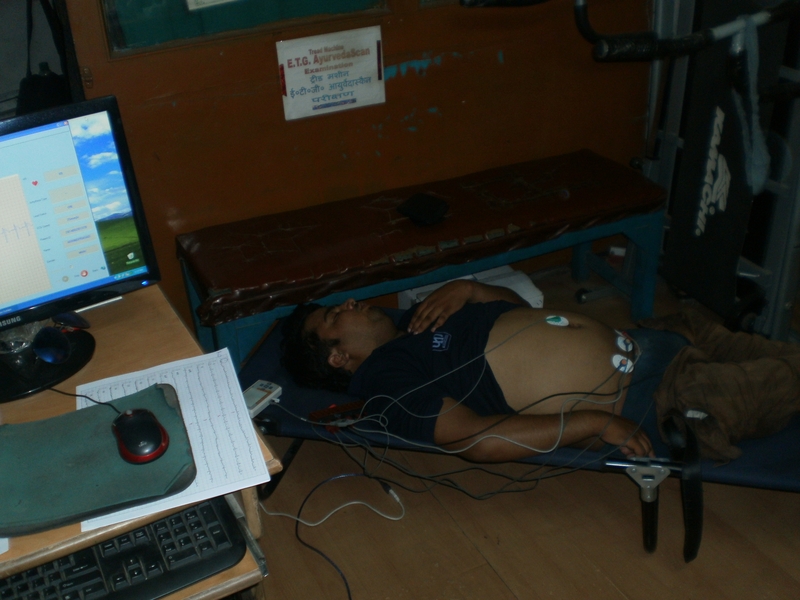 Few hours like 3 to 4 hours continuous monitoring is also beneficial for short term observations. 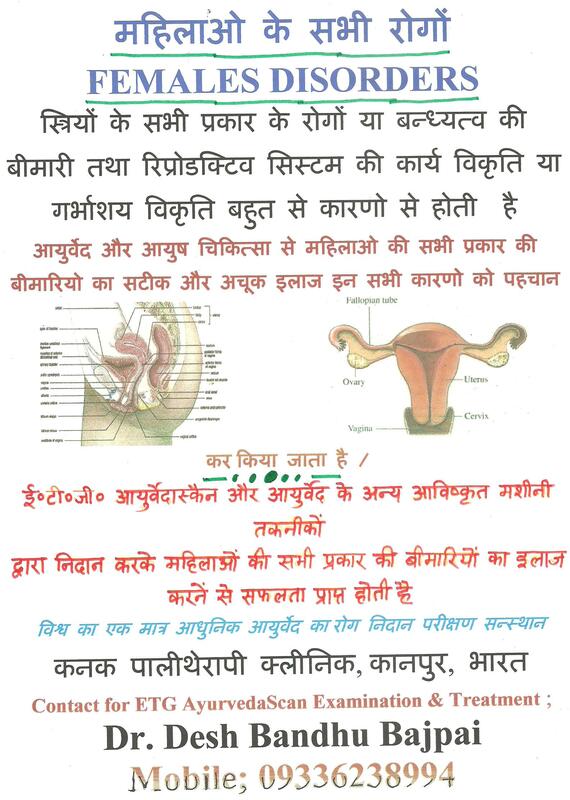 These observations are beneficial for treatment and management of the problems of patient in view of Ayurveda. 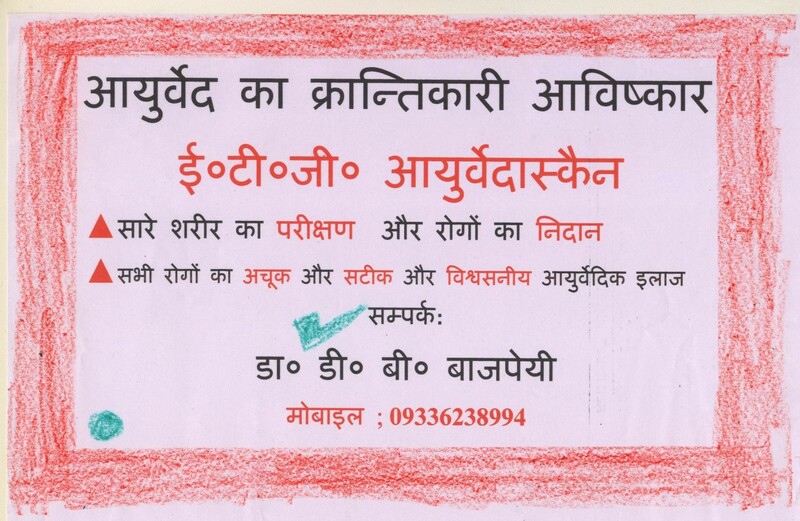 AYURVEDA divides a day in 4 hours duration . Ayurveda says that from 6 o clock of Morning up to 10 o’clock KAPHA DOSHA is peominent, after 10 AM to 2 PM PITTA dosha is prominent and after 2 PM to 6 PM VATA dosha is prominent, so is of the night, repeated the same sequence. Observations of these timings by E.T.G. 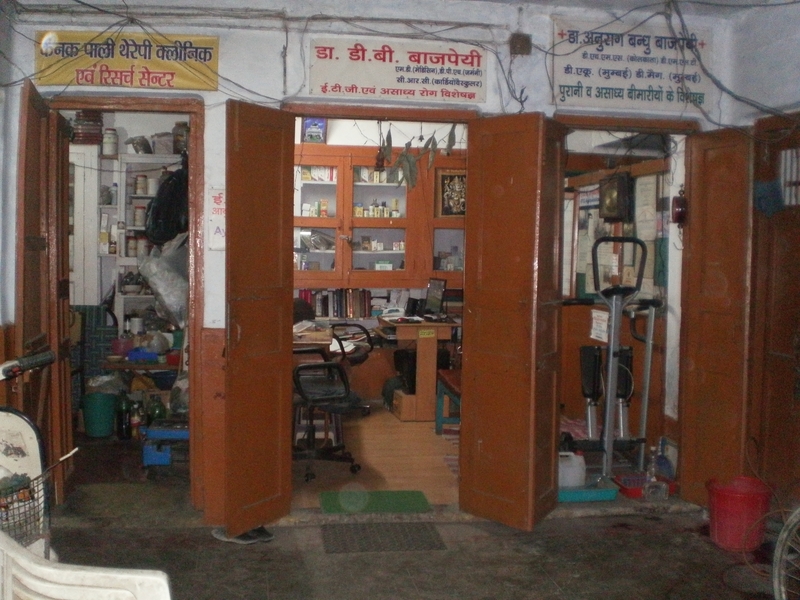 AyurvedaScan system , patients are observed in limit of the doshas for proper selection of AYURVEDIC treatment and Ayurvedic management. 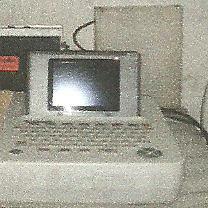 The NEW Invented system is totally mechanical and the software provides DATA for analysis and synthesis accordingly. 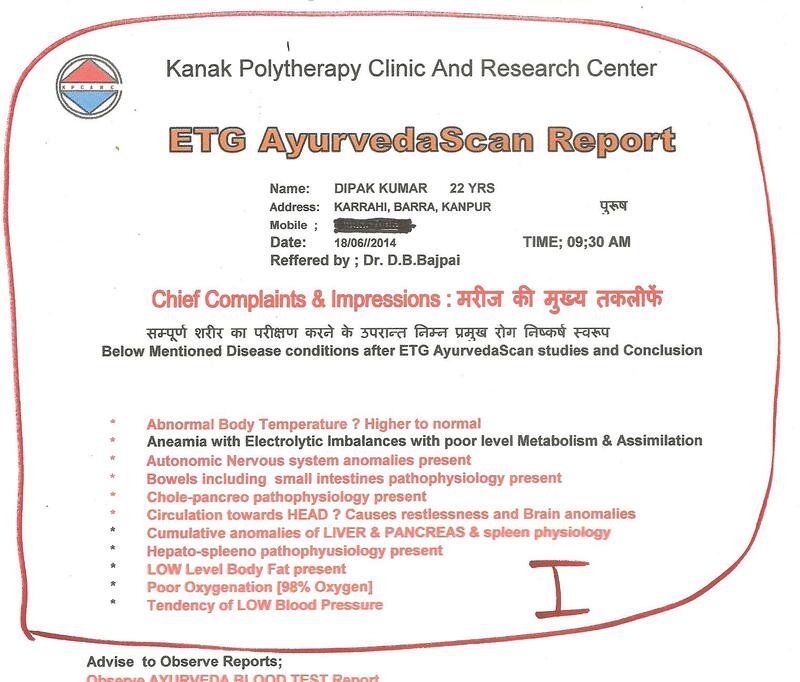 This is another innovation of the ETGAS system, developped by our research center with the commitment to improve the quality of the AYURVEDA Treatment and management in view of evidence based medicine. Heat stroke is a dreaded disease condition is tropical countries and Tropical regions. Heat stroke is very dangerous and its syndromes are sometimes confused any physician, if it is not properly diagnosed. When heat trokes or exposure of heat attacks to any person, he feelsa very Hot and sensation is like feeling of warmth and burning in skin, which aggravates from heat or sun light or heat radiation of any kind. Causing high perspiration and extreme thirst, which is unquenchable, including some times nasal watery discharge and cough , feeling of fever are some times presents. 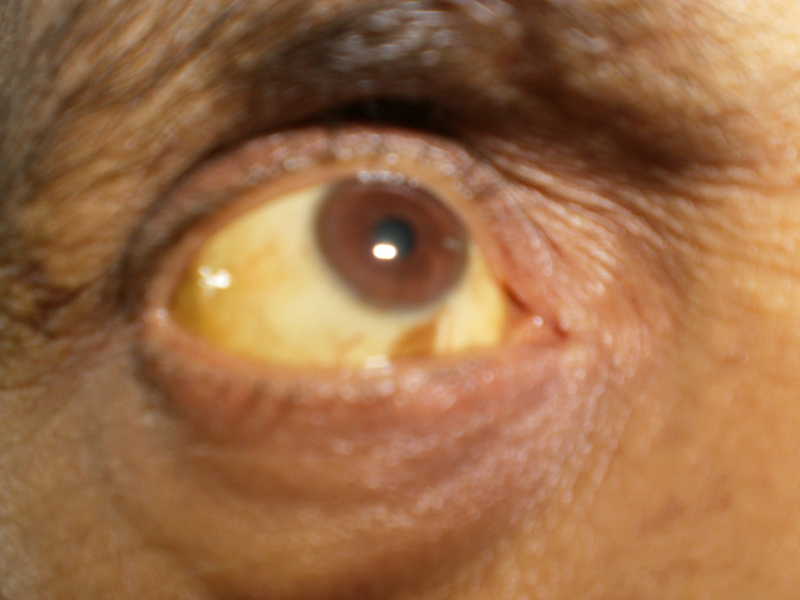 This confused the actual diagnosis and person understand that he is suffering from fever. Diarrhoea or excess perspiration imbalances ELECTROLYTES of body, which causes cardiac problems, giddiness and circulation etc. To treat this condition smoothly Homoeopathic remedy ‘GLONINE 30 ‘ is a specific remedy for this condition. 30 Potency of this remedy should be repeated 2 hourly in extreme exposure of Hewat or in Heat strokes along with the lemon sugar and salt mixture of sharbat or cold drinks and pana of unriped mango, have a beneficial effects and heals condition almost one or two days. Person should avoid extreme heat during treatment. More than 50 yrs of medical practice, I am using this remedy with great faith and never failed in the treatment of heat strokes or exposure of heat. Heat stroke is a dreaeded disease condition is tropical countries and Tropical regions. person should avoid extreme heat during treatment. More than 50 yrs of medical practice, i am using this remedy with great faith and never failed in the treatment of heat srokes or exposure of heat.